Due to the You tube’s limitation, I had to restrict the narration of the recipe to 10 minutes. I could cover important aspects of Sambar making in the video clip. However, here the text of the recipe is discussed in detail. Take pigeon peas in a bowl and wash them with water. Add water to the washed dal and keep this bowl aside. Peel the onions and cut them into thin slices. Heat a pan and add oil to it. When oil is hot add the sliced onions and fry till they turn golden brown in color. Add these fried onions to the dal and place this bowl in a pressure cooker and cook. When the pressure is fully developed in the pressure cooker and it is about to whistle, lower the flame and cook the dal for 15 minutes. Remove the dal bowl from the cooker after it is cooled completely. Churn or grind the dal till smooth and keep it aside. Wash the potato and peel the skin. Cut the potato into medium sized cubes. Peel the skin of onions and slice them length wise. Wash and clean the pumpkin and bottle gourd. Remove the skin and seeds of the pumpkin and bottle gourd. Chop the removed skins and keep it aside along with the seeds. Wash clean and cut the tomatoes into medium sized cubes and keep them aside.Take a microwave safe bowl and add the cut vegetables other than tomatoes. Add some water to the vegetables and place this bowl in a microwave oven and cover the bowl partially. Cook the vegetables on high power for 5 minutes. Stir the vegetables once with a spoon and again cook on low (30%) power for 10 minutes. Remove the bowl from oven after allowing 5 minutes standing time. Take tamarind into a microwave safe bowl and add some water. Cook this tamarind on microwave high for 45 seconds or till it reaches a boil. Keep this tamarind aside for cooling. Break red chilies into small pieces. Place all the dry ingredients in a plate. Heat a pan and add oil to it. When oil is hot add the dry ingredients and fry on low flame stirring continuously. Fry till the seeds start changing color. Take these fried ingredients in a mixie jar and add coconut pieces, pumpkin seeds, bottle gourd seeds, chopped peels of pumpkin and bottle gourd, cooked tamarind, grated jaggery and some water. Grind the ingredients to a smooth and fine paste. When rubbed between fingers the paste should be felt smooth. It needs a bit of patience to make it smooth. Sambar is a king recipe which demands the biggest vessel for being simmered till all the tastes get cross blended. Hence, take a broad vessel (a big kadhai) and add tomato pieces and some water. Cook the tomatoes till they are three- fourths done. Now add the cooked vegetables, cooked dal, prepared paste and some water. Mix all the ingredients well and cook till it reaches a boil. Lower the flame and cook for 5 more minutes. Now season the Sambar. Heat a pan and add oil to it. Add ghee to the oil and heat it. Add fenugreek seeds and fry for a while. Add mustard seeds and cumin seeds. Fry till the seeds splutter. Now add the red chili pieces, curry leaves and asafoetida. Adding fried onions to the dal and cooking the dal gives a special flavor and sweetness to the sambar. Try not to remove the skins of the vegetables used in the preparation of sambar. If removing skins chop the peels and grind them along with the paste ingredients as shown in the movie. All Vitamins lie just beneath the skin of the vegetable—so do not throw away the skins. Instead use the peels innovatively. No one will come to know, unless and until you disclose, about the peels you have ground in the masala. When the peels are ground and added the thickness of sambar increases. So to balance the consistency, add water. Remember to adjust salt for more water you are adding. Taste to check water and salt. I prefer to grind the ingredients and make a paste fresh rather than using sambar powders. If prepared this way your sambarwill always be a hit. If you wish to do less quantity of sambar, divide the ground paste into portions and store it in airtight packs in deep freezer. It will last for nearly a month without losing the taste. If possible try to cover the vessel as soon as you add the seasoning to the prepared sambar—that way the flavor of the seasoning gets mixed well with the sambar. Do not worry about the thickness of the sambar as the thickness is due to the peels and seeds of pumpkin and bottle gourd. To reduce the thickness you may reduce the dal from 100 ml cup to 75 to 50 as per your taste. Cook KANDA (Elephant Foot) and grind it to a fine paste. Add this to the sambar and reduce dal quantity. 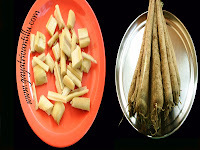 It is just a variation without any change in the taste—as KANDA is good for ladies suffering from menstrual problems. You can also add other vegetables like cucumber, ash gourd, radish,drumsticks etc to the list. Reduce the quantities of potatoes, bottle gourd and pumpkin to balance the vegetables. Add the gourd peels and gourd seeds to the paste while grinding. Here gourd means bottle gourd, ash gourd and also pumpkin. As all Vitamins lie just beneath the skin of the vegetable it is advisable to eat the skins too. 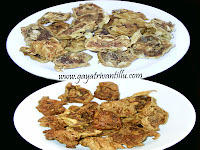 If it is not possible to cook the vegetables with skins, then grind them into a paste and add to the sambar. This way we get the required fiber also. Until you disclose no one will come to know what seeds and peels have gone into it. At times, some people increase one vegetable quantity, compared to or excluding other vegetables of potatoes, bottle gourd and pumpkin. Example say radish, then it becomes radish sambar. Those of you who want a Restaurant flavor of the Sambar may crush two cloves of garlic and add it while boiling and remove it while serving. It should leave a tinge only. Don’t be tempted to grind it with masala, else it would dominate all other spices. 1. Adding fried onions to the dal and cooking. 2. Making the masala paste as smooth as possible. Coconut should not be visible in the masala paste. Serve hot sambar garnished with coriander leaves. Sambar is a wholesome food. Looks Great and Tastes Great. This is Sushma, I am working as a programmer in US. I tried your recipes vankaya pachadi, allam pachadi and Sambar. All are very good I mean the taste, thanks for such a good show. 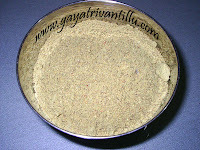 I could you please let me know how to prepare sambar powder in big quantity like 1/2 kilo to store. As a working lady if I guess correctly, you do not find time to devote for cooking. In the past I have tried preparing all different type of pastes needed for gravy dishes and deep freezed them to use them in the required quantities at a later date. They worked fine for a month. Of-course they wouldn't be as fresh as the freshly prepared ones, but partly it may be psychological feeling because I only knew which masala was fresh and which was old. My family couldn't guess. One thing you should remember, on deep freezing the effectiveness of chillies reduces for which you need to add extra chilli powder/paste while actually preparing the dish. Storing the masala in the deep freezer and reusing it much easier and healthier than cooking huge quantities of the recipes and consuming it over a period of time. The gravy dishes which I have shown are of largerer quantities, esp for the singles. In such cases i suggest you prepare the masala and use the required quantity and store the remaining in the deep freeze for a later use. This is Lahari. Today i tried Sambar. Chala baga vachindi. Gummadikaya okkate veyaledu. Thank you very much. If possible Kanda curry, pulusu or vepudu edaina sare ela cheyyalo post chestara. Thanks in advance. Bye. Thanks for the feedback. I make only Kanda Bachhali which I have already hosted. Its said that this vegetable has a property to reduce painful lumps in breasts during menstrual cycles. Therefore, I use Kanda (Elephant foot) as an optional vegetable in Gavial, Molakuttal. As a thickening agent in any gravy dish. ok andi. naku ikkada bachalakoora dorakadu. dani badulu can we use palakoora or methi leaves? Thanks for the telling me about the nutritional values of kanda. I never tried it with Paalakoora or Mentikoora. Thank you for responding so fast and posting your experience. Can u please guide us how to make sambar podi and the ingredients &their quantity to be used. I always prefer to grind the sambar masala as shown in the video every time, freshly. namaskaramulu.nenu 3 months nunchi mee recepies as-it-is gaa follow avutunnanu.maa intlo andaru hotel sambhar adagatam marchipoyaru ani chepadaniki "atisayokthi" ani anukovadamledu. meeku nenu chalaa krutagnuralini ankuntunnanu. mee oven cooked recepies anni nenu try chesthunnanu. health wise maa family chala improve ayindi ani cheppadaniki naaku chaala santhosham ga vundi. dayachesi naaku micro-oven lo 'chema dumpa fry. chese procedure cheppagalaru. I tried so many different recipes for sambar but always went in vein. After a long time, I got the sambar taste I wanted from your sambar recipe. I am so happy today. Thanks a bunch for your recipe. Thank you very much for posting Sambar recipe. just now watched this sunday i will try and let u know how it came. First time i saw sambar recipe in different way like making paste etc. Thank you once again. First of all,Thank u very much. Me vantalu chusinappudalla ma ammagaru chese vantalu gurtukuvastai.It was a great idea. meku velithe "ariselu" chesi chupistarani asistunnanu.Once again thank u so much madam. I am Harischandra Prasad, living in Bangalore with my life partner. friend has referred this link to me and I just gave a glance on this. with my old recipes' and their photos. about day-to-day life it is worth to mention any where. I have seen and learnt your way of making Sambar. I used to prepare in the past with readymade masalas thinking that making fresh masala is very difficult and time-consuming. now, I am convinced that it is not so. Secondly, frying Onions and cooking it along with Dal is a new idea I have learnt. I am yet to taste the recipe yet thanks a lot for explaining in such a beautiful manner.